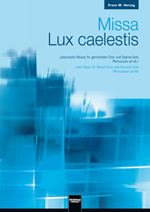 With its extensive structure, this Missa “Lux caelestis” by Franz M. Herzog follows in the tradition of the great settings of the Mass. It is characterised by an outstandingly vivid musical language, which presents both concert and chamber choirs with a stimulating challenge. All sections of the Mass can also be performed independently of one another and are available separately in the Chorus XXI series. The treatment of the Kyrie text is outstanding for the atmospheric density of its musical language. Expressive melodic lines and terse rhythmic patterns are repeatedly combined in ways which are always new and vividly convey the messages of the text to the audience. Equally emphatic is the way in which Herzog fashions the Gloria, the climax of which is an intense and powerful soprano solo (Lux caelestis). Following on musically from the first two sections, long passages of the Credo present themselves in highly rhythmical form and fascinate the listener by the subtlety with which the credo intonation is handled and by organ points, powerful melodies, a powerfully dramatic Crucifixus and expressive harmonic flows. Herzog juxtaposes the largely calm and smoothly flowing Sanctus with a livelier Hosanna in excelsis. The Benedictus largely is calm and smoothly. A lyrical alto solo radiates a very special, tremendously atmospheric air. The closing Agnus Dei with its marching 5/4 time is initially imbued with a solemn mood, but closes in complete accordance with the text with a peaceful Dona nobis pacem.